The International Thermonuclear Experimental Reactor (ITER) project represents the next step in the development of fusion energy. ITER will be the first fusion plant to have almost the same dimensions as a conventional electric power station; the mission of ITER is to demonstrate the scientific and technological feasibility of fusion as an energy source. The detailed design of the reactor has been thoroughly tested on the basis of intense R&D activities carried out by hundreds of researchers and technicians at numerous research centres, universities and industries all over the world. 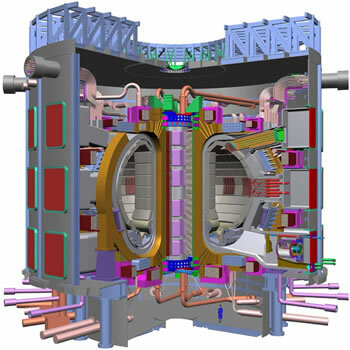 The European Union, Japan, Russian Federation, United States, the People’s Republic of China, the Republic of Korea and India signed officially (at Moscow on 28th June 2005) the agreement to realize ITER. The construction began in 2007 at the European site of Cadarache in the south of France. ITER has double the linear dimensions of JET and will generate 500 MW of fusion power for times of about 15-30 minutes. It will use and test in an integrated way all the key components required for the operation of a fusion reactor. The fundamental elements of ITER physics have been successfully demonstrated in experiments performed for a wide range of plasma parameters, reasonably extrapolated to the plasma regimes of ITER. The realisation of ITER, and particularly some of the key components, requires innovative technologies, whose feasibility has been analysed and tested on prototypes during the R&D activities carried out in the last ten years. ENEA’s Fusion Division participates in the design of ITER through the European Fusion Development Agreement (EFDA) and has made substantial contributions in the fields of superconductivity, plasma-facing components, neutronics, safety, remote handling and physics.